The fairy house is so cute! How creative! Looks just the right size for the little inhabitant! I used to do that all the time when I was younger. Lots of fun and imagination can build great things. That is a cute idea! My niece loves fairies. Oh my goodness.. how cute is that!! What a great picture! That looks like an amazing project for a sunny spring day! I love the inhabitant! Oh ho0w need and crafty! LOVE IT! Wow, tha is so nice! That is so cute and creative, I'll show my sister, she'd love tot ry that with her daughters! How beautiful! I'm sending it to my nieces! cool fairy house! I love fairies! 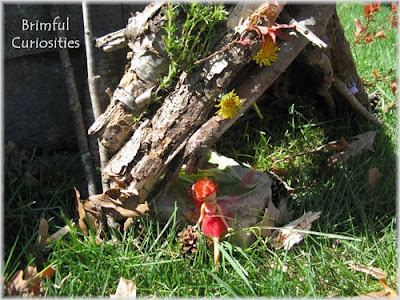 Love your fairy house and, wow, a fairy has already moved in! We've had a great time building our fall fairy house. That is a great idea! My daughter got all of the Tinkerbell fairies for Christmas, and so far they haven't been played with too much. Maybe if we made a house for them though...!? What a great fairy house! My 5 year old is into fairies, so we built one in the woods- just in a case a wood fairy needed a home. My 7 year old wasn't into it- which was sad. Why do they have to grow up so fast?? Cute picture- thanks for sharing.